Good Morning Folks! I made another scrappy card. I'm going to be honest with you. . .I have a difficult time putting together scrappy cards. I never can find an appropriate sentiment sticker. . .many of the stickers are typically scrapbook themed sentiments. Anyway, I found these alphabet die cuts to create the sentiment. 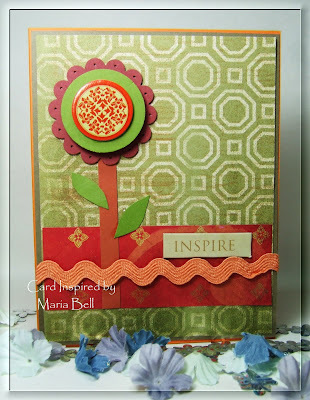 The flowers were created using a Sizzix flower die. The designer paper is by K&Co and DCWV. I don't know who the maker of the ribbon. It was just a scrap piece that I had lying around. 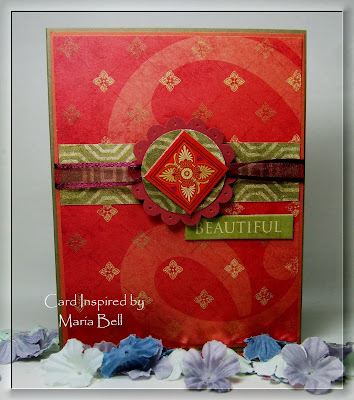 I really admire those card makers who are able to make all those pretty scrappy cards with all sorts of embellishments. 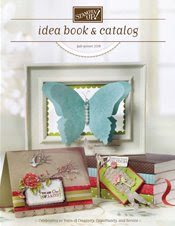 It's obvious they are seasoned scrapbookers so putting a card in a hodgepodge fashion seem to come easy for them. They use all sorts of embellishments on their cards but they don't look messy. 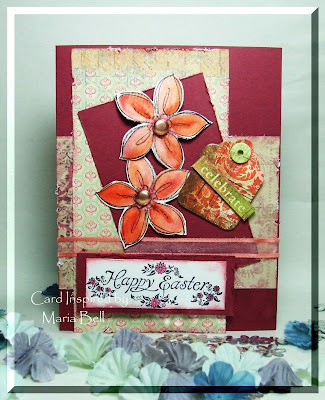 When I try to put a scrappy card with all sorts of embellishments, I don't know where to put them without feeling like the card is looking too busy. Anyway, just my thoughts about scrappy cards! Hi Everyone! I'm not very good with simple cards. I'm so accustomed to making multilayered cards and when I try to create a simple card, I always have this need to add things to it. This time I stopped myself. LOL! The main image is actually very 3D looking in person but the picture don't really reflect it. It looks better in person. I don't know. . .what do you think of this card? I really had difficulties taking a picture of this card. The flower is metallic so whenever I took a picture of it, it would be overly reflective so I would pull back the lighting to take the picture. When I did that, the metallic flower looked nice but then the rest of the card was too dark and the embossed background didn't show very well. Anyway, this was the best I could do. The stickers are by K&Co and the metallic flower is by Amanda Blu. Hi Everyone! I just wanted to let you all know that I'm now taking new members for my "stamp and scrapbooking club" for March start up date. If you interested in the details, please email me at lbmcd66@hotmail.com I have a private blog site (Heartfelt Inspirations) for club members and this layout is one that I posted on the club blog site. I post tutorials, sketches, challenges, etc for club members as well as send out project, card, and scrappy kits. I provide the materials for free for club members. 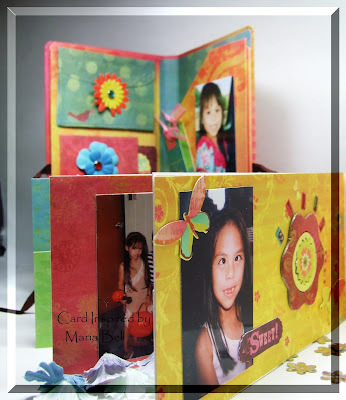 This layout was created using CTMH Good Times Paper Packet and I used the "Leading Lady" sketch from the CTMH Imagine book. The pictures of my husband and son when he was little. I created a matching layout so when you open up the scrapbook, the layouts are side by side. I had posted the first layout a few weeks ago. Anyway, let me know if you're interested in joining my club! Hi Everyone!! Just a few quicky cards I made this evening. The DPs are from Deja Views. . .aren't they pretty? I saw this paper pack at Michaels and I just thought the colors were so pretty and the patterns were so nice and elegant. I used a 1 3/8 punch and scallop punch for the center design and stuck a chipboard piece from Deja View. The chipboards match the paper pack. I have a tendency to create cards that sometimes are overly layered so I decided to go simple this time. I used the reverse side of the DPs from Deja View. The ric-rac ribbon is from Making Memories. These cards were so quick and easy to create. It was just a bit of punching and sticking on the paper and chipboard. That's it. I love these quick cards! Will Be Gone For A Few Days. . ..
Hi Gang! I decided rather than starting up a new blog for my old stuff, I'm just going to purchase a one time fee of $20 with google and I'll have 10 GB of storage space. I initially looked at Typepad but they only offer 100 MB for $4.95 a month or $49.50 a year. For 500 MB it's $8.95 a month - far less than the free space that blogger offers. Google's blogger offer 1 G (1,000 MB) for free and believe it or not, I'm already close to using up 1,000 MB. Crazy!! I love blogging but not enough to pay $50+ a year. LOL! There's no monetary return with blogging, lots of love, but no mula (money)! Too funny! But I blog for the love of doing it so I'll go the cheapest route possible! Hi Everyone! I'll be MIA for a few days because believe it or not, I am running out of memory on my blog account. 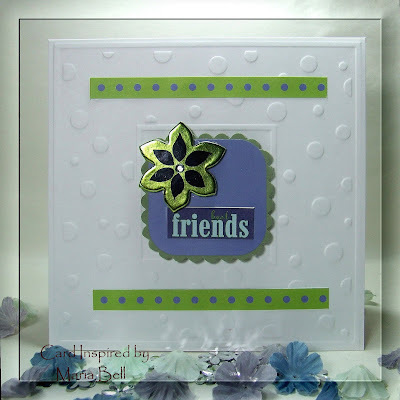 I'm going to open a completely new blog account for both my Stampin Inspirations blog site and this site and archive the older posts to a new blog. Obviously, I'll need to work on it slowly but I need few days to move some of them over. I'm almost at my maximum memory space! With all the posting and uploading of pictures I do, it's no wonder I'm running out of space!! If I don't move the older post out, I'll won't be able to post new pictures!! So, I'll see y'all in a few days!! Hope y'all have a wonderful week! While I'm away, I'll just torture y'all with my favorite band!! 30 Seconds to Mars and Jared Leto!! LOL! This is a great video, it may not be your type of music, but you'll love the message. Check it out! Hi Everyone! 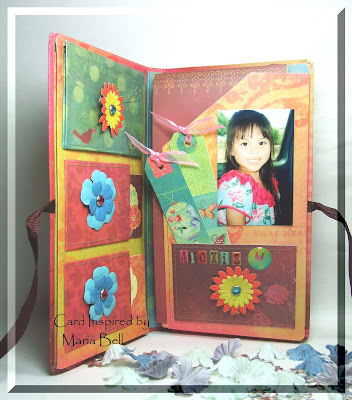 I made this mini album this evening and it was a super quicky album because it was pre-made. All I had to do was add my pictures and stick the stickers on. I did not make any of the tags or embellishments myself. I'm not really big on premade albums. I prefer to make my own mini albums. I bought this album because I want a template to recreate the mini album myself so I never have to buy another one like it again! This mini album is by K & Co. The papers are really pretty. When I have the time, I'll create a tutorial to create the album. It's actually a simple album to recreate. The pictures are of my daughter when she was little. I just chose a bunch of random pictures of her. The picture to the right is actually one of my favorite of my daughter. Here is Alexis making a funny face! Hi Everyone! Wow, I'm on the roll today! It always happens when I feel better after not feeling well. It just feels so good to feel a little bit more normal that I go through this crafting frenzy!! Anyway. . .just another card. 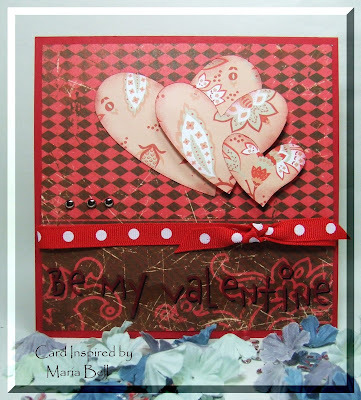 Be sure to scroll down to view the other cards I made today! The designer paper is actually the reverse of the circle that I had cut out for my previous card. I'm one who hates to waste and will try to use every scrap piece I have or save it for future use. I hate to say it but my scrap pile is HUMONGOUS. I can't keep up. Hi Everybody! I'm planning to give this card to my husband for Valentines. The sentiment says "Be My Valentines" but you can't see it. In person, the sentiment shows up better. It's a simple card but I like it. My husband don't like frilly or busy cards so I tried to keep it very simple. Hey. . .I feel so much better today! I'm sooooo happy that the nausea and vomiting is gone. Thank you for those who wished me well. I really, really appreciate your thoughtfulness! I actually like how this card came out because it's different from my typical straight angled cards! This card could be given for Valentines as well as an all occassion card. Hi Everybody!! Just a card I made. 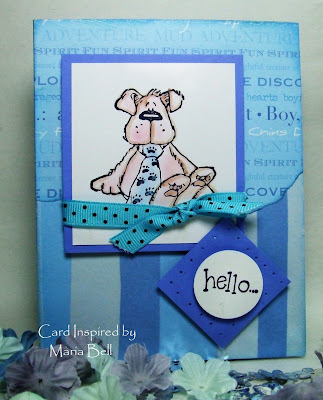 I haven't made a scrappy card for a while now but this was a fun a quick card to make. I have a lot of Prima flowers and I would really like to use them all so I can buy more of them. . .:) I promised myself that I wasn't going to buy any more of them until I used up what I already have. I really love this paper by TAC called Rustic Chic. It's a very pretty paper pack. The prima flower is a set of primas I bought at Target. I've been back there several times and they no longer stock them. Aggrrhhhh! I LOVE this set of Big Prima flowers. 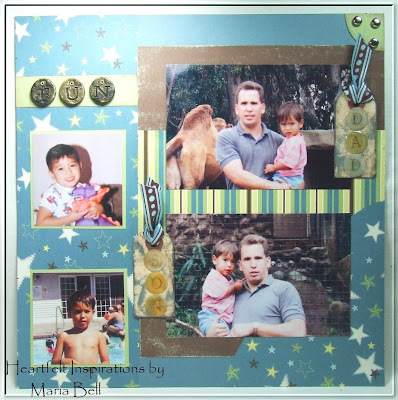 The sentiment is a metal sentiment by Making Memories and the ribbon by American Craft Elements. Both of my favorite scrappy brands. I haven't been crafting much because after getting over my bronchitis, I recently developed some sort of stomach ailment. I think I ate some really bad chicken from Wings & Things. I've been experiencing nausea and vomiting and have been unable to eat without becoming sick. I feel better today but I feel very tired. I was able to eat a little bit today but I still feel some nausea when I eat. Hopefully, tomorrow will be a better day! Hi Everyone!! Look at what I received in the mail today!! Isn't this card fabulous. 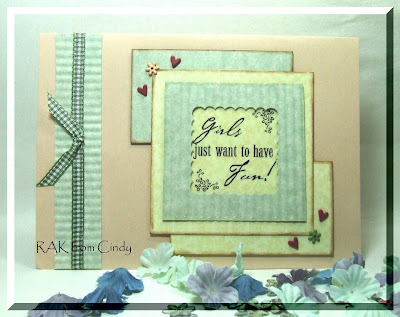 This card is from Cindy. . .one of my "stamp and scrapbooking" club member. 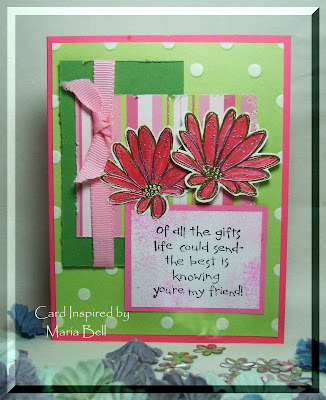 Believe it or not but this fabulous card is Cindy's first card ever! She never made a card before!! My first card DID NOT look like this at all. . .my first card looked like a little kid made it. LOL! Seriously! Well, I really appreciate Cindy's thoughtfulness. She is really a sweetheart! Thank you Cindy for being so kind! Don't forget to scroll down to the previous post for the tutorial I created for the goody bag holder I made yesterday!! Hi Everybody! Yesterday I promised to post a tutorial on the goody bag holder that I created for my daughter (see the previous post). Well, I finally finished it. In the middle of my taking the pictures for the tutorial, my camera ran out of batteries so I had to wait for it to recharge. Well, I got it done! Whoohoo! This goody bag holder is like. . .way simple. 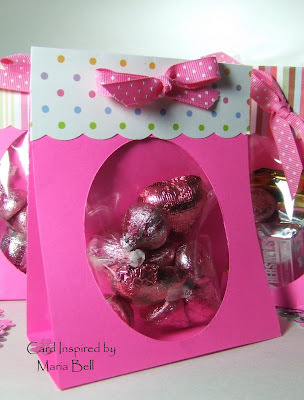 I call it the 5 minutes goody bag because you can actually create this bag holder in 5 minutes. It's that simple. 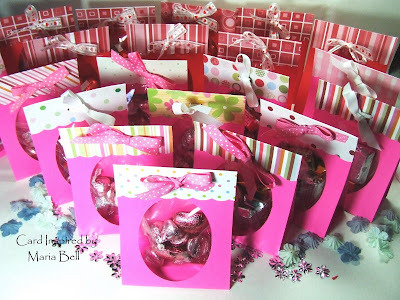 I have to make 50 of these goody bags for my daughter who wanted to give the Key Club members (she's the treasurer) Valentines goody bags. I've made 35 so far. I'm going to finish up the 50 today because she'll be handing them out tomorrow. 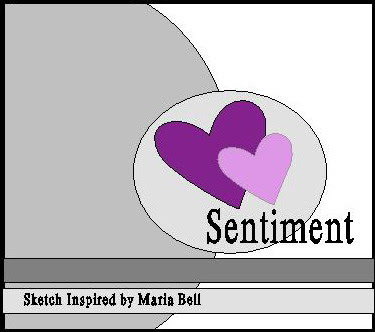 Anyway, try out the tutorial and tell me what you think! Have a great day everyone!! Hi Everyone! I finally made a scrappy project. . . you know, a "no rubber stamping" project. 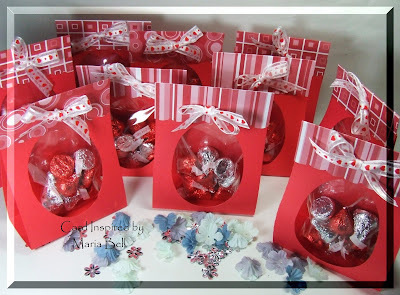 My daughter asked if I could make Valentines goody bags for the "Key Club" (Kids Educating Youths), a wonderful organization that she part of. The Key Club are teens that volunteer their time and weekends helping out the community. I feel the kids deserve a treat. My daughter is the Treasurer and my son, the Vice-President of the club and my daughter is planning to run for President next year. So. . .I, initially, said "okay" but when I asked her how many did she need, she said 50. "Fifty"!!!! Ummm. . .I said, "look dear, I don't have the time". . .does she think I'm a machine?? LOL! Anyway. . .I thought about it and decided if I could come up with a fast and easy goody bag design, I believed it was possible to create 50 bags without killing me. Well, I came up with a template that takes 5 minutes to complete the whole goody bag. Honestly. . .it takes only 5 minutes. I now believe it is possible to make 50 decorated baggies and it won't take every waking hour to make all of them. I've already made 20 of them and it took me about 2 hours to make. I'll create a tutorial for this goody bag so you can try it out. I mean, it's not a fancy baggie but kids care about the candy not the bag or box, right. I don't think they even look at the bag, they only look at what's inside the bag. I'll try to post the tutorial today! I better get started. . . Sorry I Haven't Been Around on This Blog Lately. . .
Hi Everybody! I'm sorry that I've neglected this blog site for the past few days. 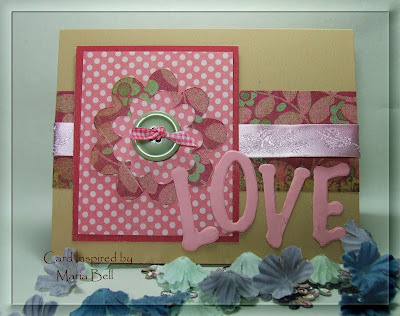 Scrappy projects take longer to make than rubber stamping projects. . .well for me that is. I'm working on a few projects that I'll post when I'm done with them. Hope y'all are having a wonderful week! Hi Everybody! These card were made with rubber stamped images but because I haven't posted on this blog site for 3 days, I decided to take cards that I typically would post on my Stampin Inspirations blog site and post some of them on this blog site. These cards were all put together with "scrap" materials. . .you know, stuff that you throw in a box, the ones that maybe you'll enventually use one day or finally decide to donate to charity. I'm participating in a swap that Gabby at "Confessions of A Stamper" is hosting on SCS. The swap is to use items in your scrap pile. I like how the card came out except for the sentiment. The sentiment don't quite match the rest of the card but I couldn't find a good sentiment in my scrap/junk pile. . .this was the best I could find. 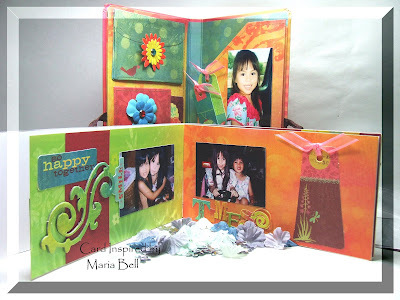 The swap theme is to use only scrap items. . .not scrapbook items. . ."scrap" items. I stamped this dog image over two years when I still was using pastels to color my images. I haven't used my pastels like. . .forever. Gosh, two years don't seem too long ago. . . I put this card together really quickly because everything was already stamped, colored, and cut up. 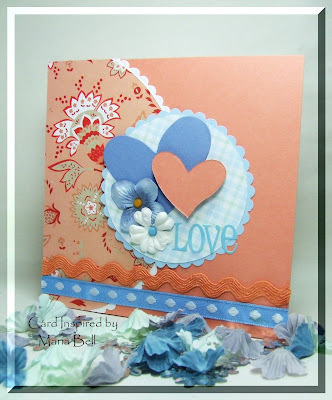 Although using scraps can be a quick way to make a card. . .it can also be difficult at times. The difficulty arises when you don't have cardstock or colored images that completely match or you have to dig through your junk to match the papers, images, and colors. You spend more time going through your pile than putting the card together. Wow. . .I really slapped all these pieces together. Seriously, I did. . .I just took pieces of designer paper, cardstock, pre-stamped images and a very old, old, stamped sentiment and put them together. What do I mean by old, old? Way back when I was a newbie stamper. I kept a lot of the images that I stamped 3 years ago and never used. This was was one of them. It's nice to finally use it. I'm not exactly loving it but I'm just happy that I reduced my scrap pile even by a little bit. Anyway. . .it's very, very late. I really need to go to bed. Until tomorrow folks or today that is. . .